One of the advantages if your website is Speech-enabled is that the users will not fix the screen and read whatever is written. They can now hear what has been written on the page. Also, it adds that little bit which makes it not like other formal and tradition websites. This article shows you how easy it is to allow your website to talk back to the user! We will make use of the Microsoft's Speech API (SAPI) to give our website such a power. SAPI has a text-to-speech engine (TTS) that we will make use of. In short, SAPI takes text as input and output an audible speech using TTS engine. By the way, every machine with Windows XP has SAPI and TTS. SAPI is a COM component that needs to be referenced in the project. First of all, open Microsoft Visual Web Developer and create a new Website. Use the Visual Basic as language. Add a reference to your project. 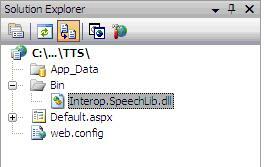 Website > Add Reference > COM > Microsoft Speech Object Library. Now throw in a text box and a button on your webpage. It may look as below. 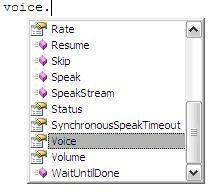 The next step is to create a SpVoice object. And finally, you can make the computer speak for you! Et voila! Oh, don't forget to switch on your speakers. 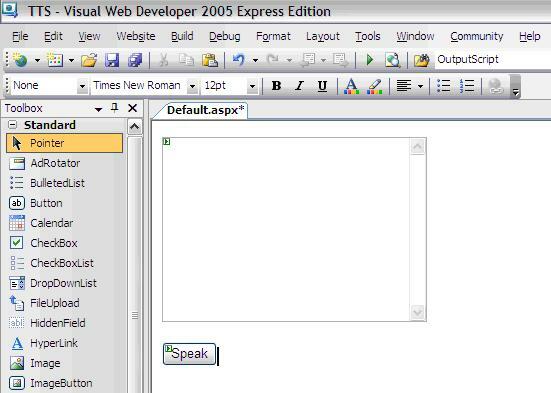 Type in a text in the textbox and click on the Speak button. You should hear someone speaking. Below is the complete little code snippet. By the way, always place your code in a Try..Catch block. Make this as a habit. Now, you can play around with the voice object by exploring the different methods and properties that the voice object can expose. Now let us try to build a simple application from what we have learnt. 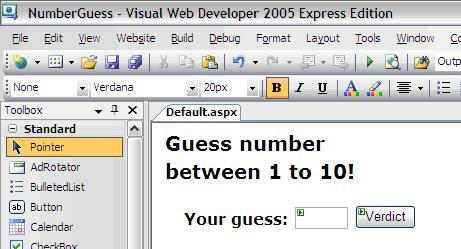 We will make an application that makes us guess a number between 1 and 10 and making the computer as the jury. The computer will speak out whether the number we have input is too high, too low or correct. Firstly, create a new Website on ASP.NET web developer and build a simple interface like below. Also, include a label, name it as lblGuessedNumber and make it as invisible. This will store a randomly generated number. Add the Speech Object Library Object as reference. To generate a random number, we make use of the Random class. On Page_Load event we place the following code snippet. Notice that the code is placed inside the Not IsPostBack() if statement as we do not want to generate a random number on every postback. Now, to validate the number that the user has input, we will make use of the following code snippet in the button's click event. Then you can output whatever you want based on the comparison using the voice object. Also, it is interesting to note that the SpVoice class is intelligent enough to interpret and say the numbers. You can try out with negatives as well. That was just an example to show you how the TTS engine can be beautifully integrated into applications. It can really give it another dimension and another feeling. Now, it is up to you to be creative and develop your own stuffs. Sample applications you can develop include: mail notifications, desktop alerts, welcoming messages etc... Note that the same techniques can be very well applied to .NET Windows application. The same class can be used. The TTS engine is unfortunately under-used! However, really cool thing can still be done with it. Go and express yourself on the TTS engine!